The aim of the present study was to investigate the expression of Fas in periarticular tenocytes of patients with osteoarthritis (OA) and to study their susceptibility to Fas ligand-mediated apoptosis. Tendon samples were obtained from the quadriceps femoris muscle of patients with knee OA and used for histological evaluation, for immunohistochemical detection of Fas, and to establish tenocyte cultures. The expression of Fas mRNA was determined by quantitative PCR. Levels of soluble Fas and soluble tumour necrosis factor (TNF) receptor I were measured using ELISA. Apoptosis was induced with recombinant human Fas ligand and measured by a histone fragmentation assay and flow cytometry. The effects of TNF-α were studied by stimulation with TNF-α alone or 24 hours before the induction of apoptosis. Tendon samples from non-OA patients were used as controls. Histological evaluation revealed degenerative changes in the tendons of all OA patients but not in the controls. Fas was detected by immunohistochemistry in all specimens, but quantitative PCR revealed significantly higher levels of Fas mRNA in OA tenocytes. In contrast, lower levels of soluble Fas were found in OA tenocytes by ELISA. OA tenocytes were significantly more susceptible to Fas ligand induced apoptosis than were control cells. TNF-α reduced the Fas ligand induced apoptosis in OA tenocytes but had no effects on control tenocytes. These data suggest that knee OA is associated with higher susceptibility of periarticular tenocytes to Fas ligand induced apoptosis because of higher expression of Fas but lower levels of apoptosis-inhibiting soluble Fas. These changes may contribute to decreased cellularity in degenerative tendons and promote their rupturing. The antiapoptotic effects of TNF-α in OA tenocytes most likely reflect regenerative attempts and must be taken into account when anti-TNF strategies are considered for OA. Osteoarthritis (OA) is a chronic degenerative disorder of the joints that affects a large proportion of the ageing Western population. It is characterized primarily by the progressive destruction of articular cartilage, but it involves the whole joint. Periarticular tendons are important functional components of joints, and degenerative changes in tendons increase significantly with age . They show considerable variability both with respect to their function and distribution around the body. In some regions, such as the shoulder, tendon degeneration may result in spontaneous ruptures, whereas in other regions this is seen only rarely . The question regarding whether there is a specific relation between degenerative changes in periarticular tendons and articular cartilage is incompletely understood. There is evidence that joint instability promotes the development of osteoarthritic changes , and most recent data suggest that abnormal composition of collagen fibrils in tendons can result in development of OA . As seen in clinical studies, dysfunction of the quadriceps muscle is a common and early feature of knee joint OA . There is a close relation between muscle strength and tendon function. Some data suggest that the changes in composition and histological structure of collagen that occur in degenerated tendons ultimately alter their biomechanical properties . However, very little is known about the molecular and cellular basis of such alterations. Tenocytes are specialized, fibroblast-like cells of mesenchymal origin that constitute the cellular component of periarticular tendons. They play an important role in producing extracellular matrix and in initiating regenerative responses following injury or degeneration. Recent studies have demonstrated that the production of collagen types is altered in tenocytes from degenerated or ruptured tendons , but little is known about the regulation of cell growth and apoptosis in tenocytes under normal conditions and in degenerative diseases, such as OA. Changes in apoptotic pathways appear to be of importance to the pathogenesis of degenerative disorders [8, 9]. Apoptosis is a physiological process and is a highly selective way to eliminate aged and injured cells. In addition to internal pathways that trigger apoptosis mainly in response to cytotoxic stress, apoptosis can be induced through cell surface death receptors that contain molecular structures called death domains. Fas (CD-95/Apo-1) and the p55 tumour necrosis factor (TNF) receptor I (TNFRI) are prominent examples of such receptors. The mechanisms through which stimulation of Fas by the Fas ligand (FasL) initiates apoptosis have been extensively investigated. It is now well established that Fas is expressed on mesenchymal, fibroblast-like cells, and alterations in the susceptibility of such cells to Fas-induced cell death have been strongly implicated in the pathogenesis of inflammatory joint diseases such as rheumatoid arthritis [10, 11]. The role of TNF-α in triggering and modulating apoptosis is less clearly defined. This is because, in addition to signalling through the death domain of TNFRI, TNF-α activates mainly signalling pathways and transcription factors such as nuclear factor-κB, which mediate the survival of cells. Thus, it is understood that, in rheumatoid arthritis synovial fibroblasts, TNF-α induces apoptosis only when signalling pathways that mediate the proliferation are blocked . Because TNF-α is involved in a variety of inflammatory and tissue repair processes, the question of how it affects the apoptotic response of potential target cells is of major interest. In the present study we investigated the expression of the apoptosis-inducing receptor Fas in periarticular tenocytes of patients with OA and studied their susceptibility to apoptosis in the presence or absence of recombinant human FasL and TNF-α. We found that OA of the knee joints is associated with degenerative changes in the tendon of the quadriceps femoris muscle that are characterized by alterations in the apoptotic response of periar-ticular tenocytes. Also, we demonstrate that tenocytes derived from such degenerative tendons exhibit a higher rate of spontaneous apoptosis and are more susceptible to recombinant human FasL induced cell death than are normal tenocytes. In contrast to normal tenocytes, TNF-α inhibits spontaneous apoptosis in OA tenocytes and strongly prevents these cells from FasL induced apoptosis. Our findings point to yet unconsidered effects of modulating proinflammatory cytokines that must be taken into account when novel biological agents such as TNF-α inhibitors are considered in the treatment of OA. Specimens of the tendon of the quadriceps femoris muscle were obtained from five patients with knee joint OA at joint replacement surgery. All patients had clinical OA according to the criteria of the American College of Rheumatology . The patients exhibited no evidence for OA in another joint of the extremities, systemic inflammatory disease, or neuromuscular disorders. Five tendon specimens of the semitendinosus muscle from patients with traumatic anterior cruciate ligament rupture were obtained during surgery and used as controls. All tissue samples were taken from tendon tissue proximal to the osseous insertions. Ethical approval was received from the local ethics committee, and informed consent was obtained from each patient. Tissue specimens were divided into two parts. One part was fixed in 4% formalin and embedded in paraffin according to standard procedures. From the second part of the tissues, tenocytes were isolated. Briefly, tissue specimens were minced, digested enzymatically (1.5% dispase I, 1 hour at 37°C), and the released cells were grown in Dulbecco's modified Eagle's medium (Biochrom KG, Berlin, Germany) with 10% foetal calf serum (FCS; Gemini Biological Products, Calabasas, CA, USA) in a humidified 5% carbon dioxide atmosphere. After allowing the cells to adhere, nonadherent cells were removed and the adherent cells were grown over four passages. Sections (4 μm) were cut, deparaffinized and pretreated in a microwave oven using 0.01 mol/l sodium acetate buffer (pH 6.0). Endogenous peroxidase activity was blocked with 0.3% hydrogen peroxide in methanol. Sections were rinsed with TBS buffer, treated with bovine serum albumin for 30 min to reduce nonspecific antibody binding, and then incubated with a mouse monoclonal anti-Fas-antibody (clone APO-1; dilution 1:10; Dako, Hamburg, Germany) for 60 min at 37°C in a humified chamber. Human pancreatic tissue served as a positive control. Negative controls included substitution of the primary antibodies with an irrelevant mouse IgG. The signal was detected using the streptavidin–biotin–peroxidase complex method (Dako), and DAB (3,3'-diaminobenzidine hydrochloride containing 0.08% hydrogen peroxide) was used for visualization. The sections were counterstained with haematoxylin. Tenocytes were trypsinized and fixed in 4% phosphate buffered paraformaldehyde containing 1% FCS. For extracellular staining, fibroblast specific antibodies (clones AS02 and D7-Fib; Dianova, Hamburg, Germany) as well as anti-CD68 (clone KP1; Signet Laboratories, Inc., Dedham, MA, USA) and anti-CD45 antibodies were used. Cells were incubated with the primary antibodies for 30 min and a fluorescein isothiocyanate (FITC)-labelled goat-antimouse IgG for 20 min. In addition, intracellular fluorescence activated cell sorting (FACS) staining was performed with anti-prolyl-4-hydroxylase antibodies (clone 5B5; DPC Biermann, Bad Nauheim, Germany). Cells were treated with permeabilization buffer (0.1% saponin in phosphate-buffered saline, 0.1 mol/l HEPES, 1% FCS) and stained with the primary antibodies for 30 min followed by incubation with FITC-labelled secondary antibodies for 20 min. All incubation and washing steps were performed in permeabilization buffer. For the analysis, a FACSCalibur (Becton Dickinson, Heidelberg, Germany) flow cytometer was used. Expression levels of Fas mRNA were analyzed by quantitative real-time PCR using a fluorogenic 5'-nuclease assay (TaqMan®; Applied Biosystems, Weiterstadt, Germany) on an ABI Prism 7900 HT Sequence Detection system (Applied Biosystems). Total RNA was extracted from 105 tenocytes using the RNeasy system (Qiagen, Hilden, Germany) and reverse transcribed using random hexamer primers. Primers and FAM-TAMRA-labelled probes for the real-time PCR were purchased as a predeveloped assay from Applied Biosystems and used according to the instructions of the manufacturer. 18S rRNA was coamplified as an internal standard. Data were calculated using the ΔΔCt method. For the detection of soluble Fas a commercially available solid phase ELISA (Quantikine Assays; R&D Systems, Wiesbaden, Germany) was used according to the manufacturer's instructions. Tenocytes (104) were seeded in 96-well plates and grown for 12 hours. The effects of TNF-α were studied by incubating the cells with 1, 10 and 100 ng/ml human recombinant TNF-α for 24 hours. To induce apoptosis, TNF-α pretreated and untreated tenocytes were stimulated with 100 ng/ml recombinant human FasL for 16 hours according to established procedures. Subsequently, apoptosis was determined using a histone fragmentation assay (Cell Death Detection ELISAPlus; Roche Diagnostics, Mannheim, Germany). This is based on a quantitative sandwich enzyme immunoassay using mouse monoclonal antibodies against DNA and histones that allow for the specific quantitative determination of cytoplasmic histone associated DNA fragments (mononucleosomes and oligonucleosomes) in the cell lysates. The data were confirmed by flow cytometry using the APO-BRDU™ kit (Pharmingen; San Diego, CA, USA) according to the manufacturer's instructions. Briefly, following induction of apoptosis, cells were fixed in 1% paraformaldehyde and incubated with Br-dUTP in the presence of TdT enzyme, which results in the incorporation of Br-dUTP into exposed 3'-OH DNA ends. Br-dUTP sites were then labeled with FITC-conjugated anti-Br-dUTP antibodies. The analysis was performed on a FACSCalibur (Becton Dickinson) flow cytometer, and labelling with Br-dUTP was compared with that of unstimulated controls. The difference between sample group means was tested for statistical significance using the Mann–Whitney U test. Sample means were considered statistically significantly different at P < 0.05. Histological evaluation demonstrated the presence of degenerative changes in the tendon samples of patients with knee joint OA but not in the controls (Fig. 1a). We found partial disruption of tissue structure, with fibrillations and inhomogeneous fibre structures. In addition, a loss of cellularity was observed. In contrast, specimens of tendons from the control tissues revealed no such changes but exhibited the typical structure of tendon tissue (Fig. 1b). Immunohistochemical analysis showed expression of Fas in all tissue samples investigated. There was scattered staining for Fas throughout the tissues (Fig. 1c,1d). Although it appeared that the staining was more intense in the OA samples, the dominance of extracellular collagen matrix over cellular structures, together with disruption of the tissues at pretreatment, did not allow for quantitative analysis. Histological examination of tendon tissue from patients with knee joint osteoarthritis (OA) and controls. 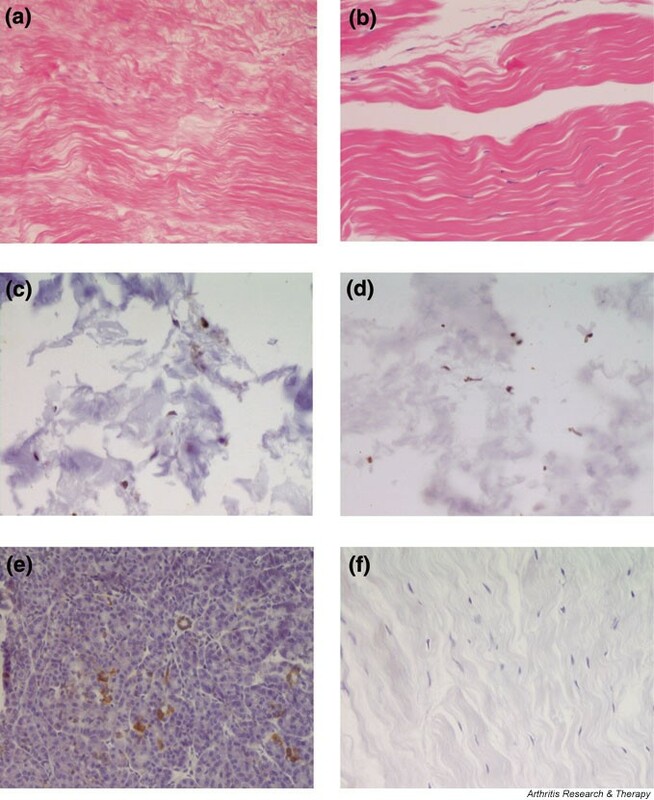 (a) Haematoxylin and eosin staining of tendons from OA patients revealed characteristic changes of tendon degeneration such as disruption of the tissue structure with fibrillations, inhomogeneous fiber composition and loss of cellularity. (b) In contrast, tendon tissue from controls showed the typical structure of normal tendon tissue. (c)–(f) Immunohistochemistry revealed expression of Fas in all samples. There was a scattered staining for Fas throughout the OA (c) and non-OA (d) tissues. Staining was slightly more intense in the OA samples but there was a clear, characteristic dominance of extracellular collagen matrix over cellular structures as well as some tissue disruption following pretreatment. Pancreatic tissue (e) was used as positive control. There was no staining in the negative controls where the primary antibody was replaced by an isotype matched immunoglobulin (f). In order to characterize the tenocytes and exclude potential contamination with cells of the monocyte/macrophage lineage, isolated OA tenocytes were analyzed by flow cytometry. FACS staining for the macrophage lineage marker CD68 was negative in all cultures (<1%; Fig. 2a), and the common leucocyte marker CD45 was also absent (<0.1%; Fig. 2b). In contrast, all tenocytes (>99%) stained positive for the fibroblast markers AS02 (Fig. 2c) and D7-Fib (Fig. 2d). Intracellular staining of tenocytes with antibodies against prolyl-4-hydroxylase was also positive (>99%; Fig. 2e), confirming their fibroblast-like nature. There were no differences in the expression of cell surface markers between OA tenocytes and tenocytes from controls (data not shown). Characterization of osteoarthritis (OA) tenocytes by flow cytometry. (a) When compared with isotype control staining, analysis for the macrophage lineage marker CD68 showed no surface expression (<1%). (b) Also, no expression of the leucocyte common antigen CD45 was found on the cells (<0.1%). (c) However, fluorescence activated cell sorting analysis with the fibroblast marker AS02 showed positive staining of all the cells (>99%). (d) In addition, more than 99% of the tenocytes stained positive for the fibroblast markers D7-Fib. (e) Intracellular staining for prolyl-4-hydroxylase (>99%) confirmed the fibroblast-like nature of the tenocytes. To compare directly the expression of Fas receptor in periarticular tenocytes from OA patients and controls, we measured the levels of Fas mRNA in these cells by quantitative real-time PCR. As shown in Fig. 3a, there was considerable expression of Fas mRNA both in OA tenocytes and in control cells. However, expression levels of Fas mRNA were significantly higher in OA than in control cells (P < 0.05). Specifically, expression of Fas mRNA in OA tenocytes was 7.2-fold increased as compared with that in tenocytes from patients with traumatic rupture of the anterior cruciate ligament. Interestingly, we did not observe higher expression of the soluble form of Fas. Instead, OA tenocytes exhibited lower levels of soluble Fas in their cell culture supernatants than did control tenocytes from non-OA patients. As measured by ELISA, expression of soluble Fas was 1.6-fold higher in the tenocytes from control patients than in OA tenocytes (Fig. 3b). Incubation of tenocytes with TNF-α over 24 hours resulted in a dose dependent upregulation of soluble Fas in both OA and non-OA tenocytes. 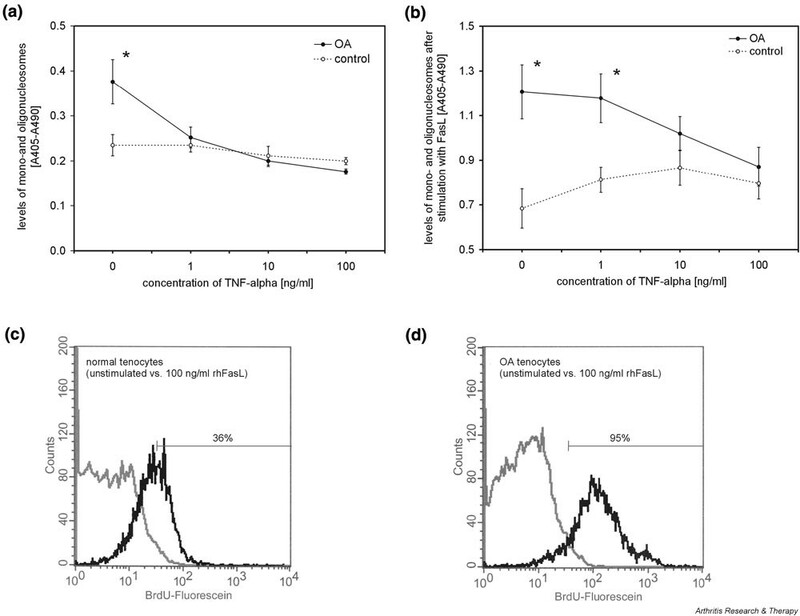 However, higher expression of soluble Fas in the control tenocytes was maintained with all TNF-α concentrations (P < 0.05; Fig. 3b). TNF-α decreased the expression of soluble TNFRI both in OA and in control tenocytes in a dose dependent manner, but there were no significant differences in the expression of soluble TNFRI between OA and control tenocytes (data not shown). Expression of Fas in osteoarthritis (OA) and control tenocytes. (a) Expression of Fas mRNA was analyzed by quantitative real-time PCR using the TaqMan® system (Applied Biosystems, Weiterstadt, Germany). Expression of Fas mRNA was seen in OA tenocytes (n = 5) and in control cells (n = 5), but expression levels were 7.2-fold higher in OA tenocytes than in control cells. 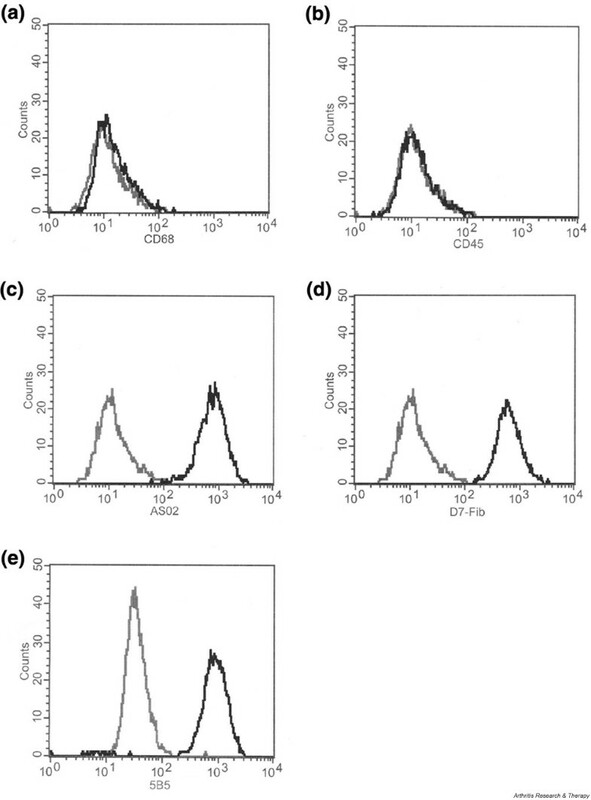 (b) Expression levels of soluble Fas (sFas) in the cell culture supernatants of OA tenocytes (n = 5) and control cells (n = 5) as determined by ELISA. OA tenocytes showed 1.6-fold lower levels of sFas in their cell culture supernatants than did control tenocytes. Stimulation with tumour necrosis factor (TNF)-α over 24 hours resulted in a dose dependent upregulation of sFas in all tenocytes, but higher expression of sFas in the control tenocytes was seen consistently with all TNF-α concentrations. *P < 0.05, versus control. Based on these expression data, we then analyzed the susceptibility of periarticular tenocytes to TNF-α and FasL induced cell death. Tenocytes from OA patients exhibited a significantly higher rate of spontaneous apoptosis than did normal control tenocytes (1.6-fold [P < 0.05]; Fig. 4a). Interestingly, incubation of OA tenocytes with TNF-α for 24 hours resulted in a dose dependent suppression of programmed cell death in OA tenocytes to the level of normal tenocytes. No significant effects of TNF-α on spontaneous apoptosis were noted in tenocytes from normal controls (Fig. 4a). Stimulation of OA and normal periarticular tenocytes with 100 ng/ml recombinant human FasL for 16 hours strongly induced apoptosis, as seen from an enrichment of mononucleosomes and oligonucleosomes in the cytoplasmic fraction of these cells (Fig. 4b). However, there were considerable differences between OA and normal tenocytes in that OA tenocytes exhibited a significantly higher susceptibility to FasL induced apoptosis than did control cells (P < 0.05). Whereas OA tenocytes showed a 3.3-fold increase in apoptosis, as seen from an accumulation of histone complexes following FasL stimulation, this increase was only 2.8-fold in normal tenocytes. These data were confirmed by flow cytometry. Using the APO-BRDU™ assay (Pharmingen), which labels DNA strand breaks, 95% of OA tenocytes exhibited signs of apoptosis following stimulation with 100 ng/ml recombinant human FasL for 16 hours (Fig. 4d), whereas this was seen in only 36% of control cells (Fig. 4c). Again, TNF-α had clearly inhibitory effects on OA tenocytes and prevented these cells from undergoing FasL induced apoptosis in a dose dependent manner (Fig. 4b). In contrast, no inhibitory effects of TNF-α on FasL induced apoptosis were noted in the control tenocytes. Apoptosis of tenocytes. (a) As determined by the levels of cytoplasmic histone-associated DNA fragments, tenocytes from osteoarthritis (OA) patients (n = 5) exhibited a 1.6-fold higher rate of spontaneous apoptosis than did normal control tenocytes (n = 5). Stimulation of OA tenocytes with tumour necrosis factor (TNF)-α for 24 hours resulted in a dose dependent suppression of programmed cell death in OA tenocytes but had no effects in tenocytes from normal controls. (b) Stimulation of OA and control tenocytes with 100 ng/ml recombinant human Fas ligand (rhFasL) for 16 hours strongly induced apoptosis. OA tenocytes (n = 5) exhibited a significantly higher susceptibility to FasL-induced cell death, and TNF-α prevented these cells from undergoing FasL-induced cell death in a dose-dependent manner. No such inhibitory effects of TNF-α on FasL-induced apoptosis were seen in control tenocytes (n = 5). *P < 0.05, versus control. (c) Fluorescence activated cell sorting analysis of two representative cell cultures revealed that 36% of non-OA tenocytes stained positive with the APO-BRDU™ assay (Pharmingen; San Diego, CA, USA) following stimulation with rhFasL (black line) versus unstimulated cells (grey line). (d) In contrast, 95% of OA tenocytes showed signs of apoptosis. OA is a common degenerative joint disease, and alterations in the apoptosis of articular chondrocytes have been associated with the pathogenesis of this disease. Although a recent study failed to demonstrated higher rate of apoptosis in ageing or OA cartilage , a number of other investigations have reported that articular chondrocytes from OA patients exhibit higher levels of programmed cell death. These conflicting results appear to reflect methodological problems as well as problems with patient selection  and highlight the necessity for investigating the specific contribution of changes in apoptosis to the pathogenesis of degenerative joint disease . The present study provides evidence that knee OA is associated also with degenerative changes in periarticular tendons, which are characterized by alterations in the apoptosis of tenocytes. In this context, two observations appear to be of importance. First the data show that tenocytes from degenerative tendons display greater degrees of spontaneous apoptosis than do normal tenocytes and are significantly more susceptible to the induction of programmed cell death by recombinant human FasL. Second, the findings suggest that the proinflammatory cytokine TNF-α has strong apoptosis inhibiting effects in periarticular tenocytes from OA patients but does not affect apoptosis significantly in normal tenocytes. In our experiments, periarticular tenocytes from OA patients exhibited a 1.6-fold higher rate of spontaneous apoptosis than did control tenocytes, which strongly supports a concept that links degenerative changes to increased apoptosis. In addition, the data illustrate that OA not only affects the articular cartilage but also involves the surrounding soft tissue of the joints. The underlying mechanisms for apoptotic alterations in OA remain unclear but it appears likely that, at a cellular level, degenerative changes affect the apoptosis machinery in its entirety, including mitochondrial pathways and TNF receptor family signalling. The latter is illustrated specifically by the fact that OA tenocytes not only showed a higher rate of spontaneous apoptosis but also were significantly more susceptible to FasL mediated cell death. Of note, apoptosis of fibroblast-like cells is regulated at a number of different levels, and there is evidence that secondary modulation of signalling pathways downstream of Fas may alter significantly the susceptibility of cells to Fas induced cell death . However, the expression of Fas receptor on the cell surface together with the levels of soluble Fas are important factors that determine the susceptibility of cells to apoptosis. In the present study periarticular tenocytes from OA patients showed significantly higher expression of Fas receptor than did control tenocytes. At the same time OA tenocytes exhibited lower expression of soluble Fas, which is produced as an alternatively spliced variant of Fas and has been shown to exert antiapoptotic effects . Thus, our data suggest that, apart from mechanical stress as was reported most recently , increased expression of Fas receptor together with reduced levels of soluble Fas constitute the basis for the higher susceptibility of OA tenocytes to apoptosis. Although a functional link between increased apoptosis and facilitated rupturing of tendons still needs to be established, it may be hypothesized that increased apoptosis constitutes a contributing factor to reduced cellularity and altered tissue stability. Data reported by Yuan and coworkers  support this notion by demonstrating that the number of apoptotic cells is significantly elevated in ruptured supraspinatus tendons as compared with normal subscapularis tendons. The inhibitory effects of TNF-α on apoptosis of OA tenocytes are of special interest. This is because TNF-α has been demonstrated to facilitate apoptosis in a variety of cell types, including fibroblast-like cells. Thus, it was demonstrated that TNF-α enhanced Fas induced cell death in renal interstitial fibroblasts  as well as in dermal fibroblasts . However, the general concept of TNF-α acting as an apoptosis inducing factor in fibroblast-like cells was recently challenged. Specifically, it has been suggested that, in rheumatoid arthritis, TNF-α may have apoptosis-inhibiting effects , most likely through stimulation of Akt kinase phosphorylation pathways . In our study, TNF-α had strong apoptosis-inhibiting effects on OA tenocytes. This was seen not only from a dose-dependent reduction in spontaneous apoptosis but also from an inhibitory effect on FasL induced cell death. In this context, TNF-α increased the expression of soluble Fas in OA tenocytes, which may provide an explanation for the reduced susceptibility of OA tenocytes to FasL induced apoptosis following TNF-α treatment. However, this was seen also for normal tenocytes, in which TNF-α did not affect apoptosis significantly. Also, no changes in the expression of soluble TNFRI were seen in OA tenocytes and normal controls. Therefore, it may be hypothesized that differences in signalling pathways rather than mere regulation of receptor expression contribute to the differences between OA and normal tenocytes. The antiapoptotic effects of TNF-α in OA tenocytes most likely reflect regenerative attempts that contribute to maintaining tissue integrity. Although the molecular basis of altered apoptosis in tenocytes from OA patients will require further investigation, these data must be taken into account when anti-TNF strategies are considered in the treatment of OA. Specifically, it will have to be investigated whether potentially beneficial effects such as decreased production of nitric oxide  interfere with the regenerative capacity of tendons. tumour necrosis factor receptor I. The authors wish to thank Bianca Henning, Sibylle Pietzke and Desire Weber for their expert technical assistance. The support of Kathleen Schmidt in processing the data is gratefully acknowledged. Also, the authors thank Dr Janet Fernihough for reading the manuscript. The work was supported by the Deutsche Forschungsgemeinschaft (DFG PA689-2, NE 505-4) and the Bundesministerium für Bildung und Forschung (NBL-3).